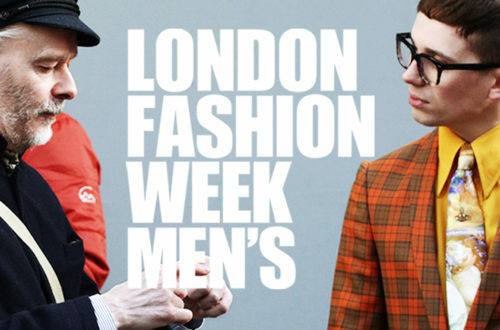 I didn’t really post too much from London Fashion Week Men’s, no real reason, I just didn’t. 🤷🏻‍♂️ I did, however, shoot quite a few polaroids this time around for my #StreetStylePolaroids project I’m slowly building up. But alas, the season was a fun one – a really bloody hot one, but a fun one all the same. Anyway, when I’d checked the weather forecast before venturing down to the big smoke, it said that it wouldn’t be too hot particularly. Unfortunately for me, my packed suitcase of clothes didn’t quite match up to how hot it actually became when I got there. Needless to say, I styled it out and made dripping forehead sweat part of my ‘look’. If you can’t laugh you’ll cry and tears are just more water on my body. 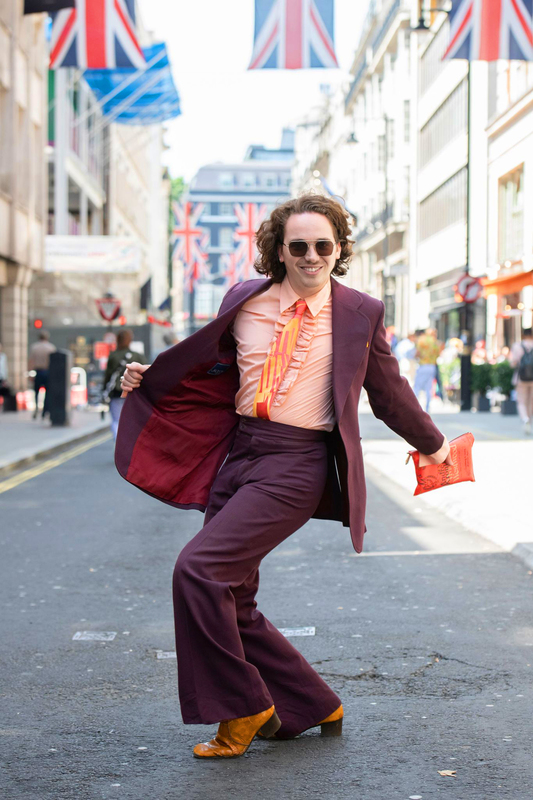 So on Day 1 of London Fashion Week Men’s Spring/Summer 19 collections, I wore a nice thick 70’s flared suit. It turns out that suits from yesteryear were built to last so I was particularly hot in this little number. But hey, back sweat is the new black! 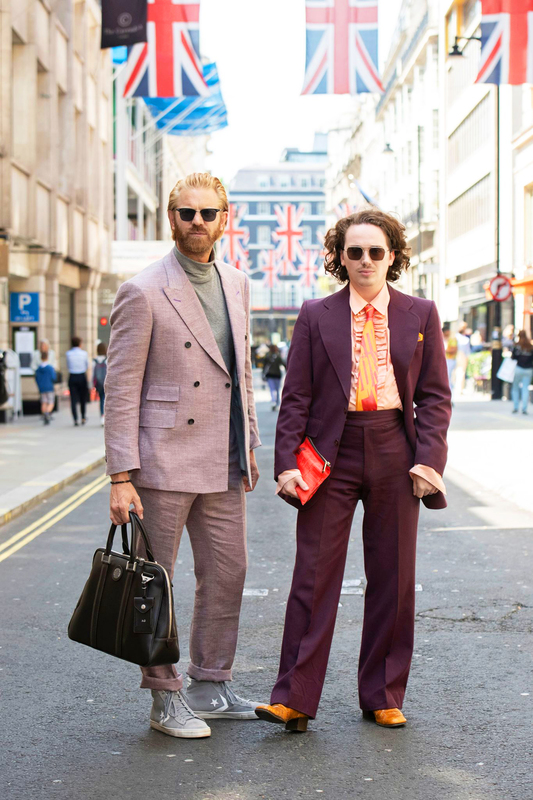 The photo was shot by Kirstin Sinclair who is one of my all-time favourite ladies of LFWM street style. She’s a brilliant photographer and one of life’s good eggs. Kirstin has photographed me at so many Fashion Week seasons now and I will never tire of her taking my picture. She’s a real superstar who captures the best of my flamboyance and strange attires. Here’s another image Kirstin shot just moments later of myself and Alistair Guy. Maybe it was the great summer weather, the sunglasses or the British flags flying proudly down the street, but this moment truly made me enjoy this season of menswear. Either that, or it was just an excellent backdrop for great LFWM street style. 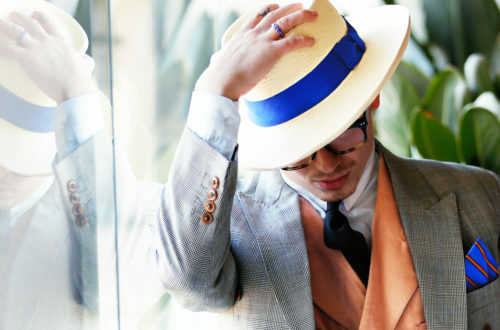 Don’t get me wrong, I do love modern clothing, but there’s something I really like about a vintage suit. 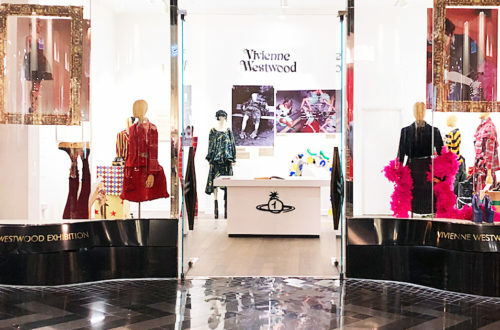 I think it’s all in the wide lapels and flares – I just can’t get enough. I also had the privilege of going to the ‘Vogue Hommes Presents GarçonJon: 10 Years Of Steet Style‘ exhibition of Jonathan Daniel Pryce’s photography work. This was a really nice exhibition filled with some beautiful photographs (and great cocktails). 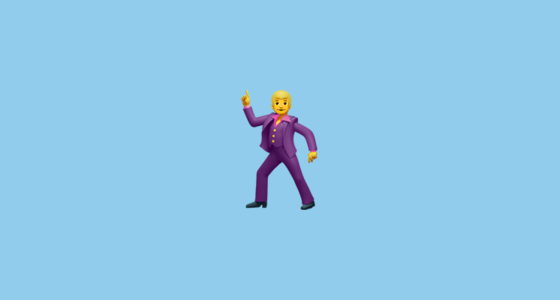 It was only when I took my tie off did I realise that I had legitimately come dressed as the Apple’s ‘dancing man’ emoji. What can I say, Apple’s emojis have great taste in apparel.